ANCHORAGE, Alaska -- Crews plan to search through a debris area Wednesday for three men believed killed when a landslide described as a sea of logs and mud swept through part of an Alaska coastal town. A Sitka fire official said late Tuesday night that the men are presumed dead and the search will be a "body recovery effort." The avalanche occurred Tuesday morning but a search was hampered by unstable terrain. Sitka fire department spokeswoman Sara Peterson told The Associated Press Tuesday night that operations were suspended until a geologist assesses the stability of the slide area Wednesday morning. She described the search as that of a "body recovery effort" - a determination based, in part, "from the force of the slide and that kind of impact." The slide is believed to have trapped the three who were missing from a neighborhood in Sitka. At one point officials said four people were missing but then backed off to three. A city building official is among them. City officials identified him as William Stortz, 62, who also is the city fire marshal. The Daily Sitka Sentinel first reported the identity. City Administrator Mark Gorman delivered the heartwrenching news to Stortz's wife, CBS affiliate KTVA-TV's Heather Hintze reports. "I was the one who called her to tell her husband was missing in a landslide," Gorman said. "And she came up with her orange, rubber gardening gloves, just a mess, and saying, 'I'm here to start digging.'" "Most of us don't have a lot of hope," family friend Peter Turner said earlier in the day. Peterson said the others are brothers, 26-year-old Elmer Diaz and 25-year-old Ulises Diaz. Chris Harshey, who is a carpenter, was working on a nearby home when the slide occurred. "All of a sudden, I heard crackling and crumbling, and then the lights flickered," he told the Sentinel. Harshey went outside to investigate and saw "a sea of large logs, mud, more logs and a slurry of muddy debris." The slide destroyed a home about 200 yards above him and damaged another home closer to him. The entire landslide lasted about four minutes, he said. Gov. Bill Walker planned to tour Sitka on Wednesday to observe the damage. "Our thoughts and prayers are with those who are missing and all the people affected by the disasters in Sitka today," Walker said in a statement. One of the newly built homes was destroyed in the landslide, and another was damaged, Peterson said. Some other homes in the area were evacuated, but Peterson did not know how many residences or people were affected. Homes in town have been flooded, and there were reports of residents not being able to reach their homes or leave their neighborhood, said Jeremy Zidek, a spokesman for the state Department of Homeland Security and Emergency Management. The landslide at the construction site was especially heartbreaking, he said. "It's pretty devastating on how fast something like this can happen," Simpson, a retired commercial fisherman, said in a phone interview from a saloon. 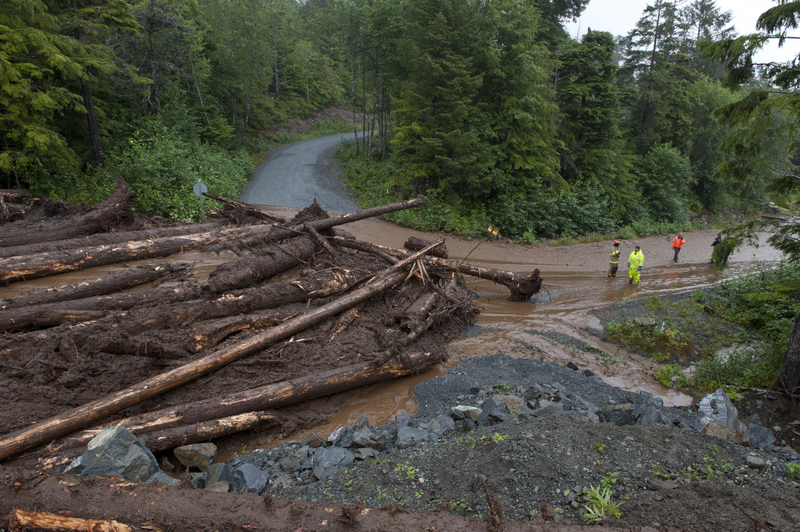 Heavy rain was blamed for a major landslide in September near the town that wiped out hundreds of thousands of dollars in watershed-restoration projects. The rain also damaged a footbridge and trails, including one that had been repaired after flooding in January 2014.